In that year, I lived with the Conti family. In rapid order, they became my family. I also visited family in Rome for the first time. They became my friends. 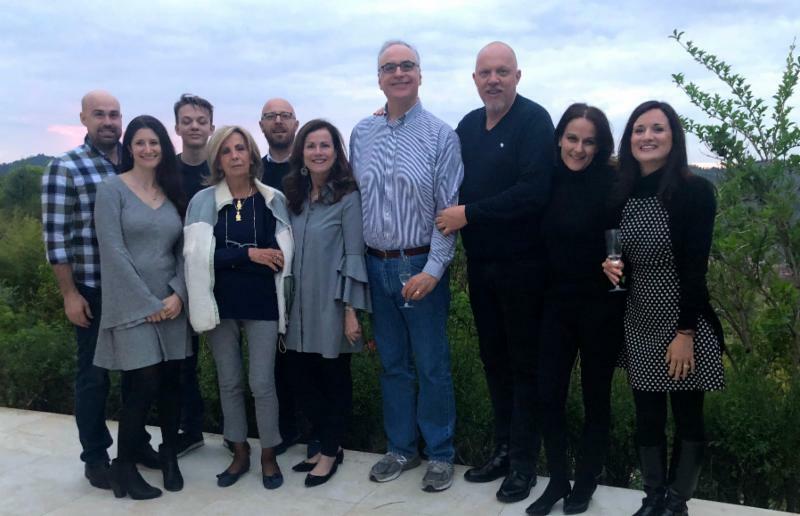 This week, forty years after that fortuitous year abroad, I started the week in Rome celebrating my cousin’s birthday and will conclude the week with dinner in Bologna with treasured family and friends. 1. Social connection and belonging. My paternal grandmother was born in Rome. She moved to the United States as a young professional for a year – that turned into a lifetime. My father and the rest of our family had never met our extended family in Rome until I was in Italy in 1980-81. It was the beginning of connection to family who over the years have become friends. When it comes to mental health, the data are clear that families play a role at many levels. Of course, we inherit our biology from our family, which may put us at risk for one mental illness or another. Our social connections with family members are also significant – both in terms of risk and resilience related to mental illness. When being part of a family provides a “sense of belonging,” we are protected from the pernicious effects of isolation and loneliness that can be associated with mental health risks, including depression. 2. Connection and belonging are not always easy. Mental illness can put significant strain on social connection and belonging. As I noted in another Five on Friday, my paternal uncle lived with schizophrenia. Uncle Hank was first diagnosed when he was in his early twenties. For all the years that I knew him, he lived in an institution with unremitting symptoms of psychosis. Like many others with serious mental illness, he struggled to stay connected to family or friends. Today, programs like CSPNJ and Fountain House promote connection, belonging and community for individuals with serious mental illness. Such programs are transforming what it means to live with serious mental illness. For all of us – with serious mental illness or not – we now have good science documenting the valuable – maybe even vital – role of belonging and purpose to promoting mental health and well-being and ensuring quality of life. 3. Tutti a Tavola! In Muslim countries, there is the call to prayer (adhan) five times per day. In Italy, there is the call to the table twice per day. Everyone to the table, it is time to eat. Yes, what we eat is important to our mental health (see Five on Friday We Feel and Think What We Eat). Italy knows this truth, and there is no shortage of delectable dishes. As important as what we eat, is how we eat. When we have a routine of dining together, we have a chance to provide support at times of stress. We can observe the course of illness for someone (consider someone living with depression, an eating disorder or dementia) and intervene early. We can convey that no matter what, everyone belongs – not only at the table, but within our community. Whether around food or organized around other activities, practices that promote connection and combat isolation are good for our mental health. 4. Beyond dinner conversation. Dinner conversations run the gamut, but it is likely that conversations about significant mental health concerns will need to extend beyond this setting. One of the most common experiences we have when we care about someone who has a mental illness is that we aren’t sure what to say. Perhaps the place to begin is to concern ourselves more with listening than with talking. Being in Italy this week, with several family members who are physicians, I am reminded that cultures and families vary widely in terms of what is considered appropriate and therapeutic when someone is not well, regardless of the specific illness. Mental Health America(MHA) provides thoughtful guidance on how to initiate a conversation, listen without judgment, and educate ourselves to increase understanding related to mental illness. MHA also provides important guidance on how to know when it is time to reach out for professional help. These conversations can be difficult and uncomfortable. Navigated thoughtfully and compassionately, they can be life-affirming and life-saving. 5. Friday night dinner. I launched this blog three years ago with a piece entitled Why Five on Friday. In Jewish tradition, Friday evening marks the beginning of Shabbat, the day of rest. From the time my kids were little, my family has been inspired to keep this tradition of Friday night dinner at home as a time to pause and pivot, to reflect and imagine. This Friday in Bologna, in what can only be considered a miraculous moment of life’s choreography, I will carry on this tradition with three generations of Contis – my friends-turned-family, my dear friend, Ben, known as Uncle Ben to my children, and my nephew and his girlfriend who will join us from Florence where he happens to be for work this week. Surely for me a serendipitous and magical way to celebrate three years of Five on Friday. Thank you for joining me on this journey of Five on Fridays. Thank you for being part of a community that enhances my sense of belonging and purpose. My aspiration remains the same as when I launched the blog three years ago: I hope each week that you find something that prompts you to pause and pivot, to reflect and imagine on mental health in your everyday lives. Bit by bit, friends and family, we are changing the narrative on mental health and mental illness.